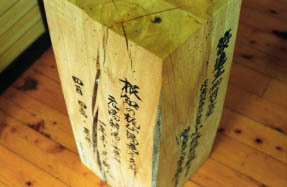 The hut of a wooden structure where the Japanese one hundred famous mountains "Mt. Amakazari" north foot was countrified.It leaves the thick pillar and beam which started from the mountain and have borne the heavy snowfall in 100 or more, and it becomes Heisei and is rebuilding.These days, a guest room and a dining-room are extended and it is becoming comfortable.The open-air bath "hot spring of Gymnaster savatiererii" into which it goes at the time of the nightfall of summer was the highest after mountain climbing.It is a bench of the extensive garden on heights, and if an after bathing is blown on the refreshing breeze of a mountain and it relaxes in beer one hand, they will be this and the highest.and another pleasure here -- snow, such as a dish of wild plants, a Yukizasa wild plant, an Amadokoro, a Udobuki, a bamboo shoot, -- the fresh wild grass unique to a deep district can be tasted.Electricity is early the night of a home generation of electricity, 9:00 putting out lights, and a hut. 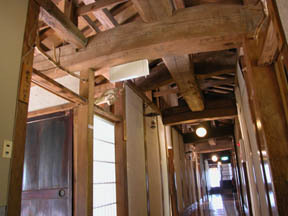 * I do business as a hut even now along which the road passed in Heisei 11.It is not a ryokan with a hot spring. * I ask the inn of the Nagano-ken Otari hot spring, and a mistake for there not to be. 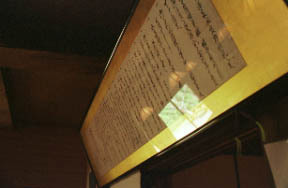 Writing between Masatoshi Bun who wrote the conveied history of the hot spring. It is a good-location-to-see complete view about a sea valley cluster of summits. The snowy country building of a thick pillar and a beam. 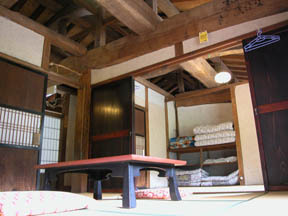 Guest room "amakazari" - "gold mine"
They are mainly the Itoigawa local culinary specialties about wild grass. It is in 40 to 50 minutes by car from a three-spined stickleback river-fishing port, and fresh seafood enters.Boiled rice has cooked Niigata Koshihikari at the hot spring.Although it becomes slightly yellow, it is reputation, when a mineral is abundant and it is delicious. 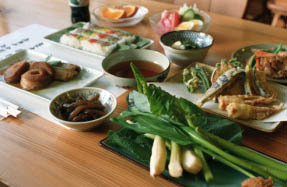 Shozan, such as climax Aralia cordata, a Udobuki, and an ascetic's-Gyo-jya garlic, -- a vegetable - wild grass tempura and Petasites japonicus - chikuwabu vegetables boiled hard with soy, sushi wrapped in bamboo grass, stir-fried vegetables, a salad, hot spring boiled rice, a dessert, etc. Meal place: Every morning and evening is a dining-room. Man and woman each 1. It drops in and is hot-spring:500 yen. The open-air bath of mixed bathing is 1. Usually, although it is a single room, please give me the sharing a room at the time of rush hours. 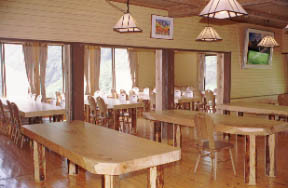 The Heisei 12 extension, a beautiful large dining-room. It becomes the Mt. 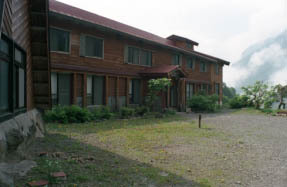 Amakazari trailhead in Kajiyama, Itoigawa-shi, Niigata-ken in an enough hut.Hotel Amakazari-so Otari in Nagano-ken is another. [ -- * important] -- when you put an institution name into car navigation, please give as an amakazari. It becomes on foot [ of about 2 hours ] by about 6 km and a descent from the mountain villa up to the Yamaguchi bus stop. It changes to about 45 minutes and about 8000 yen in case of a taxi. From the Itoigawa station, it is a bus and is the Yamaguchi bus stop. 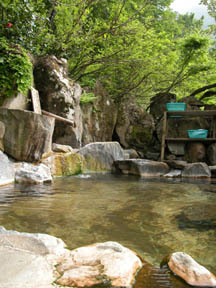 The bottom gate of a hot spring is equipped fully.